Happy Three Clover Thursday! In honor of Breast Cancer Awareness Month, Kerry issued the Challenge Think Pink! I added Black to my Pink themed card, as I love this color combination. Here I stamped the Calla Lily Collage from The Rubber Cafe in Black, then used the Marker Watercoloring Technique to add color to the image. 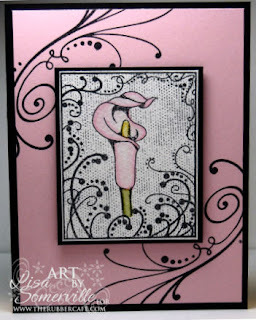 The Flourish in the background is the Fleuradidy 2, stamped in Black on Pink card stock. Be sure to click on the Three Clover Logo on my sidebar to check out what the other designers created this week. Oh Lisa... this card is so nicely done. Your use of the flourish stamp really accents the focal image. I don't know why but the calla also reminded me of a lighted candle. Pink and Black are gorgeous together too! This is beautiful Lisa..I love the image and the beautiful swirls that give this card an understated elegance. Beautiful image, calla lillies are my favorite! This is gorgeous, and the colors are fabulous. Breathtaking! Love how you used the swirls to create a sense of flow in the card!